Chimbu Deven’s latest film may be set in a fantasy world of strange creatures and magical beings, but the story itself is mundane without any of the epic sweep required for such a tale. It’s also slow going, with most of the first half a dreary romance between Marudheeran (Vijay) and Pavazhamani (Shruti Haasan), although it does improve post interval once Sridevi and Sudeep appear onscreen. Despite the numerous fight scenes and explicit violence, the simplistic plot seems to be aimed more at children, with every obstacle easily overcome and the obvious outcome never in any doubt. That may also explain the relatively bloodless scenes of dismemberment and general carnage that would more usually be awash with gallons of fake blood, but instead the fight scenes here are frequently lacklustre, dull and repetitive. However there are a few reasons to watch, mainly down to Sridevi in her extravagantly evil queen avatar, good special effects and the always reliable Sudeep and Vijay. Puli tells the story of a land which has been invaded and settled by a race of demons, who have enslaved the native humans. These Vedalam are easily recognisable by their blue eyes, tendency to sprout fangs when annoyed and ability to fly though the air, although their spiky armour and general arrogant grumpiness are a more distant and therefore safer method of identification. The young Marudheeran arrives in one of the subjugated villages as a baby, floating in a basket on the river, along with a mysterious egg that hatches into a talking bird. The talking bird is pretty well done as far as special effects go, and I was expecting it to be important to the plot in some way, but it really isn’t. Even though there is a sort of reason for the bird’s inclusion at the end, basically it’s a very under-utilized special effect that didn’t need to be able to talk and doesn’t get much chance to do so anyway. Overall this illustrates the problem with most of the special effects in the film. Although they are well done, the effects dazzle for a moment but are then relegated to background noise and ultimately have little to add to the plot. It’s a shame as the film looks fantastical but the uninspired story keeps it earthbound. Marudheeran is adopted by one of the villagers and is trained by his stepfather in fighting and disguise as part of a general communal wish to overthrow the demons. 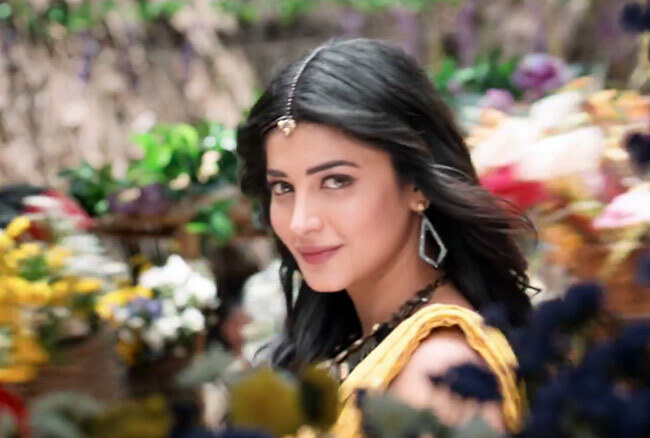 However once Pavalamalli (Shruti Haasan) returns to the village, Marudheeran spends his time chasing after his childhood friend, much to the displeasure of her parents. Just as Marudheeran and Pavalamalli get married in secret, she is stolen by the demons and Marudheeran sets out with his trusty friends Thambi Ramaiah and Sathyan to rescue her from the impregnable city of Vedalakottai. They plan to disguise themselves as demons to get into the city and then hope they can find Pavalamalli and get out again, but that’s it in terms of preparation. There is no attempt to deal with the epic scale of such an endeavour and make the journey and planning part of the adventure. This means there isn’t any sense of danger or excitement, just a pedestrian slog to find the city and rescue the girl. Nothing new, and could just as easily have been set in the present time anywhere in India with much the same plot and ending. Still, there are plenty of good ideas in Puli, it’s just that they get such short shrift and don’t have as much impact as they should. For example, Marudheeran and colleagues meet a race of miniature people where there is a brief ‘we can show you the way’ moment and then the little people are used mainly for comedy. However the effects and the cinematography are once again very good, with clever use of seeds and leaves as clothing, and wonderful peanut shell blouses that are simply inspired! 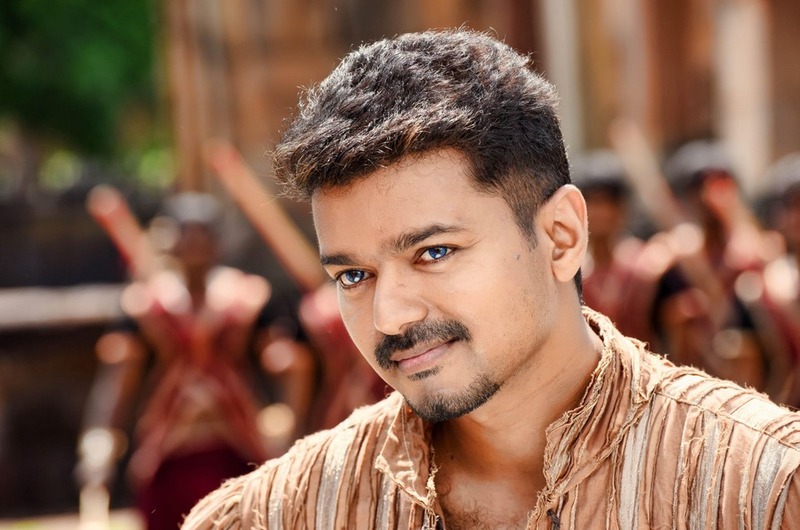 Unusually, Vijay doesn’t fit as the hero of the film as well as he should, at least initially. His introduction and the subsequent fight scenes establish his character as more of a trickster and comedian while his pursuit of Pavalamalli is pedestrian and lacking animation. 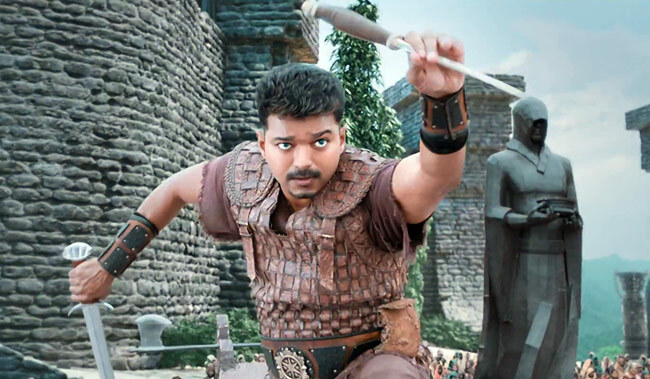 It’s not until the second half of the film where he comes up against his nemesis General Jalatharangam (Sudeep) that Marudheeran starts to properly fill the role of the warrior hero and Vijay gets a chance to throw his energy fully into the part. Just about at this time though there is a flashback sequence where Vijay plays his father – a man born to be in a shampoo commercial and doomed by his reliance on slow-mo fighting and accompanying wind-machine. I did appreciate Vijay’s mastery of the hair toss though and once he gets into full warrior mode, there is no stopping him. 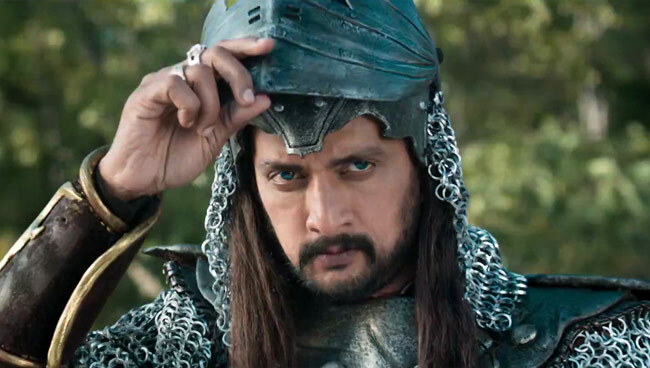 Sudeep is good in a role that lets him convey volumes with just a look and a sneer, although he really needed more time onscreen being evil to make his character thoroughly despicable. Jalatharangam is a fairly standard villain but Sudeep imbues him with an arrogant coldness that works well and there’s just enough sliminess added for good measure. 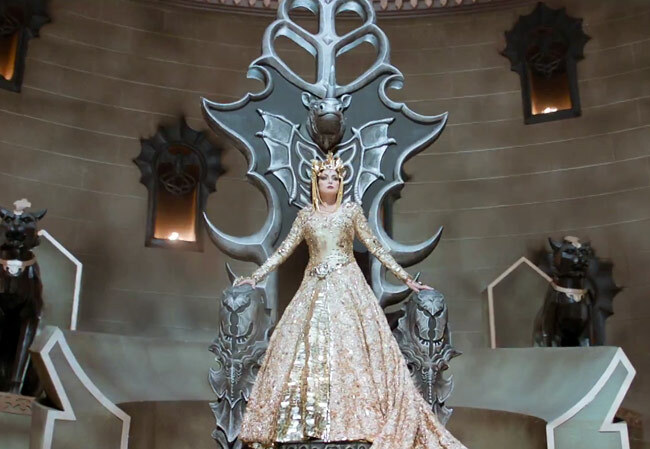 Sridevi too makes the most of her role as an evil queen and shows what a fantastic actor she is even with her limited time onscreen. She totally owns each scene when she appears and her sweeping presence lifts the energy of the film. She has the best costumes and stunning make-up but these go almost unnoticed beside her commanding presence and expressive eyes. And she plays a harp – perfect! I hope this, and her recent appearance in English Vinglish mean that we will get to see more Sridevi films in the future – she is the best thing about Puli for sure. Hansika Motwani plays Queen Yamanadevi’s daughter and at least Chimbu Deven doesn’t make the mistake of trying to get her to actually dance in any of her songs. Hansika looks good and has an amazing peacock outfit at the end but doesn’t do much else of note in the film, although she does manage better chemistry in a few brief moments with Vijay than Shruti does in an entire romantic song. Overall Devi Sri Prasad’s songs are fairly uninspiring and the choreography rather repetitive, but Vijay is energetic and the backing dancers are enthusiastic in a range of diverse costumes. 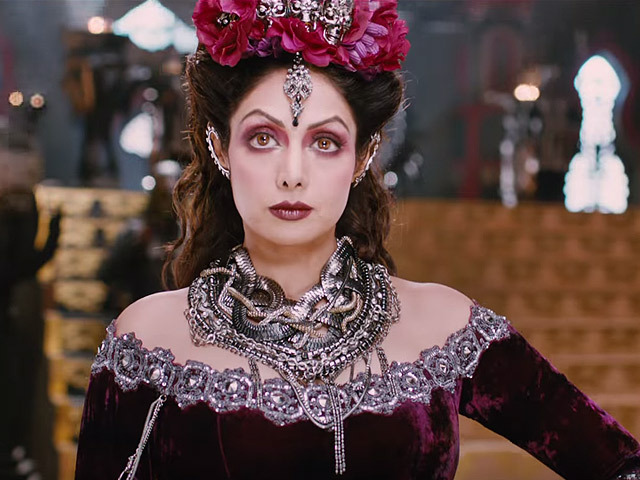 Except for Sridevi, Puli mostly disappoints with a weak story and fairly nondescript songs. 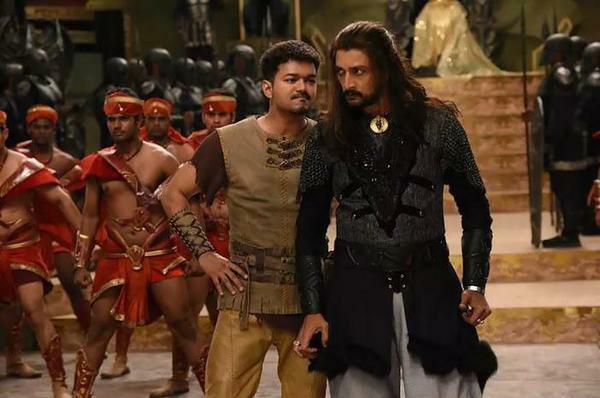 Sudeep and Vijay are fine but both characters need better definition and depth rather than simply relying on the ability and star power of the actors. Both do what they can, but the film could have been so much better with just a little more complexity. 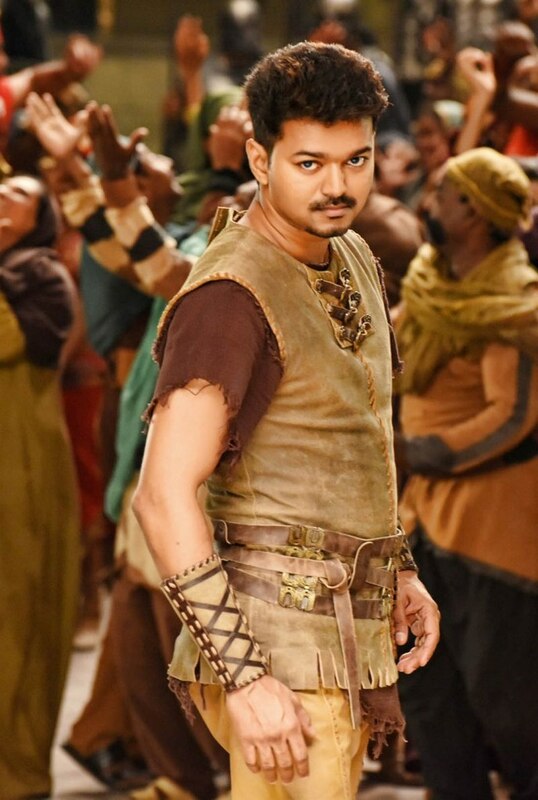 Good cinematography from Natarajan Subramaniam and great visual effects make Puli worth watching on the big screen but probably only for fans. 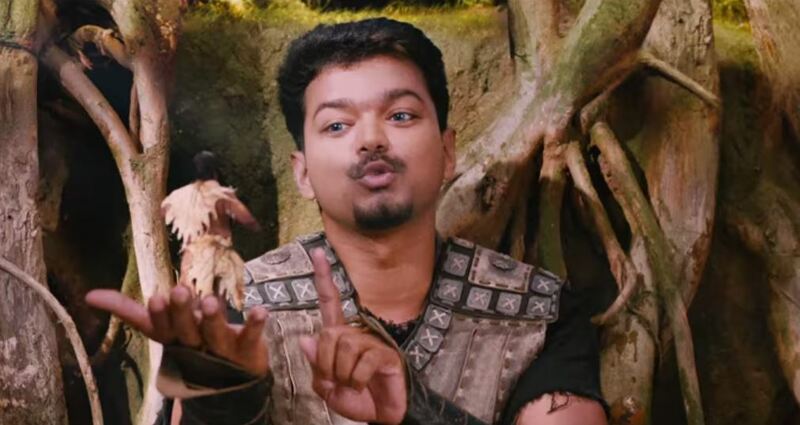 Otherwise probably best to wait for the DVD where the fast forward button will make Puli a more enjoyable watch. This entry was posted in Kollywood and tagged Chimbu Deven, Devi Sri Prasad, Hansika Motwani, Natarajan Subramaniam, Puli, Shruti Haasan, Sridevi, Sudeep, Tamil, Thambi Ramaiah, Vijay. Bookmark the permalink. Thanks for the review. I adore Sridevi, and had been looking forward to another Bahubali type adventure. The reports are unanimously unappealing, so I’ll do as you say and wait for the DVD – so I can judiciously use the fast forward button. 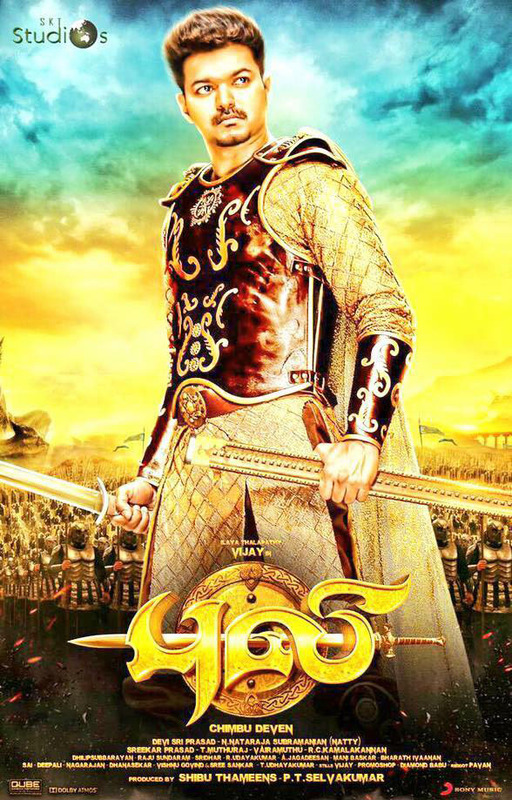 Another Baahubali this is not – more like Anaganaga O Dheerudu or even Kochadaiiyaan. 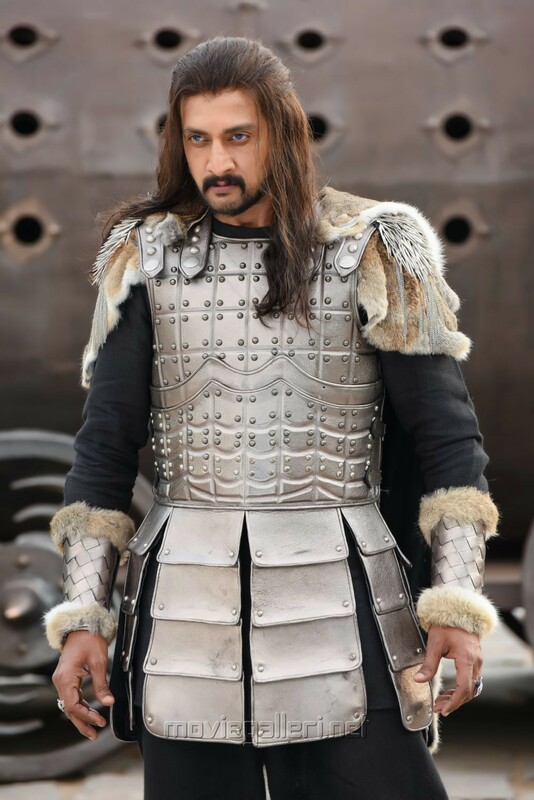 It is worth watching the DVD for Sridevi (and Sudeep) in the second half though – even Vijay wakes up and becomes more of a warrior once he reaches the demon’s city. Look out for the scorpion motif everywhere too – the visual effects really are excellent and it’s such a shame that the rest of the film doesn’t reach the same standard.